Hello May! As the days fly by, I spend more time reflecting, taking several moments to simply breathe & soak in the occurrences of life. The month of April was essentially preparation for Coachella — getting a new tent, making sure the air mattress pump was compatible with the car, & investing in a mini fan to combat the brutal heat. 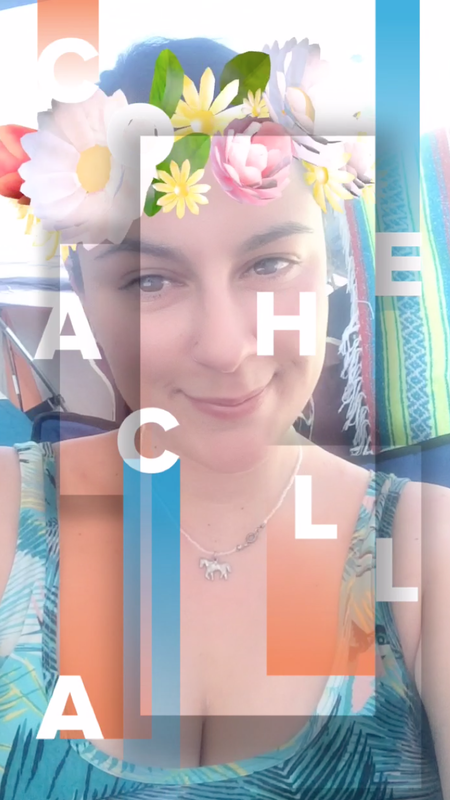 This is a special edition of My Month From A - Z, focusing on Coachella. View January, February, & March. A$AP Rocky - I can't say I'm the biggest Rocky fan in the world, but it was fun to see him live. His intro featured Andy Samberg from Saturday Night Live fame & I got a huge kick out of it. A$AP's performance was lively & fun & just a good time. He also brought Miguel as a guest! 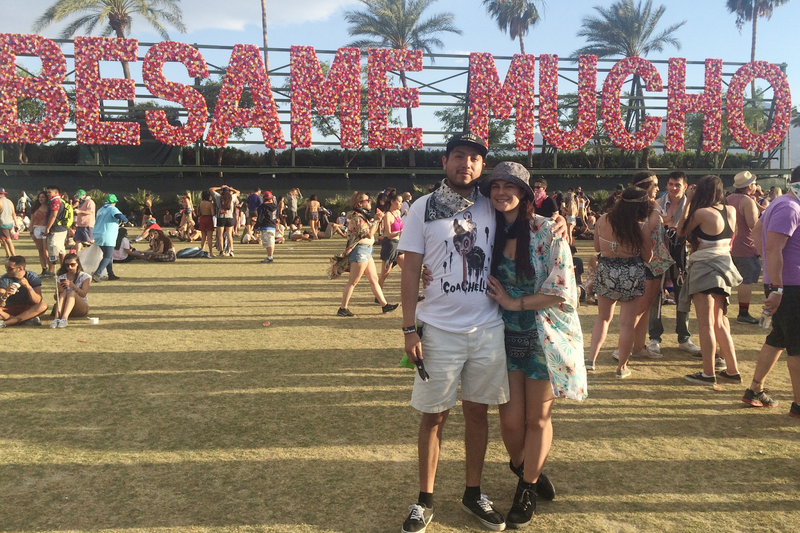 Besame Mucho - Coachella is an arts & music festival, so Besame Mucho was one of the most popular works this year. You probably saw it on your Instagram feed at some point. When you got up close, you could see the cute floral details. Car Camping - This was the second year in a row we did car camping. Although we were veterans, it's still a tedious task setting up a campsite under the Indio heat. On a positive note, it's awesome to be so close to the entrance of Coachella. We were just five rows away from it! Donut Farm - We ended up getting Donut Farm, who specializes in vegan donuts, a couple of times. We tried the Earl Grey lavender donut (mixing two of my favorite things), the double blueberry, the banana fritter, & something else that escaped my mind. Ellie Goulding - I wouldn't say I was the biggest Ellie fan going in but after seeing her live performance both Fred & I left in awe. Her live voice & graciousness really hit home for us. She's beautiful to watch as well. Frances - Fred & I were just lollygagging, waiting in the Gobi tent to shield ourselves from the sun when Frances, a British singer & pianist, came out. She was talking to the crowd, engaging with us. Her music was lovely as well. Guns N' Roses - You wouldn't believe how much I used to listen to Guns N' Roses back in high school. I never thought I'd see the day when they'd be performing together again. Although Axl's leg was broken, the show rocked. Slash still shreds! Hats - In the extreme heat of Indio, California, you better believe it's in your best interest to wear a hat. Trust me on this one. Ice Cube - Oh my lordy! I'm a huge Ice Cube fan in the first place. During his performance, we were eating some vegan Jamaican food & enjoying everything about him. He brought up Dr. Dre & Kendrick Lamar too. Amazing. 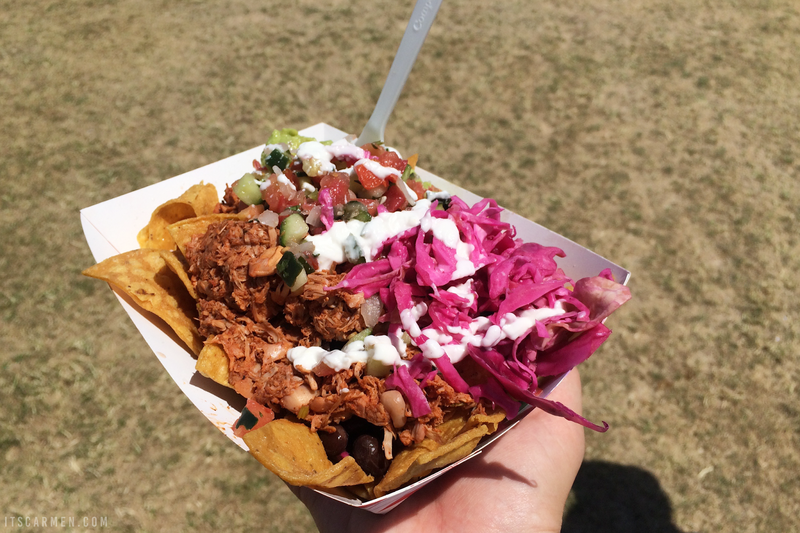 Jackfruit Nachos - To be honest, I've never had jackfruit before, so I didn't really know what I was going into at the time. It was extraordinarily delicious. Kendrick Lamar - As I mentioned a couple letters ago, Kendrick Lamar came out during Ice Cube's set. I'd been hypothesizing that he'd be making a guest appearance since last year, so I'm glad that my theory finally came true. Låpsley - This one was another happenstance performance that we caught. We were waiting to see somebody else & ended up catching Låpsley. She was divine live & had such a cool demeanor. She kind of reminded me of Adele. Milky Bun - Fred & I have been fantasizing about Afters Ice Cream since last year's Coachella, so the very first thing we bought on the very first day was a Milky Bun — an ice cream sandwich made with donut instead of cookie. Neighbors - One of the greatest parts of car camping is getting to know your neighbors. On Thursday night we sat around & shared a few drinks with our neighbors, talking about life, relationships, & careers. It was wonderful. Outfits - There weren't many outlandish outfits at Coachella. I believe this was because I went Weekend 2 not Weekend 1. Weekend 1 has all the celebrities & fashion bloggers. Poutine - Remember how I talked about poutine in this post? Well, I finally had it! It was a vegetarian-friendly mushroom poutine. My mouth still wants some. Recycling - As gross as it may sound, Fred & I were going around the campsite collecting cans in order to exchange them for Coachella memorabilia. We ended up getting enough cans for a t-shirt, a poster, & a tote bag. Sounds good to me. I'd highly recommend participating in the recycling program! Sunscreen - Sunscreen is absolutely vital if you're going to Coachella, especially in the daytime. Temperatures are upwards of 90°F with the sun beating down on you. Sunscreen is a must. Slather it on like there's no tomorrow. The 1975 - We only caught a couple songs before moving on to a different set, but as always they were catchy as hell. Vince Staples - We were first row for Vince Staples, albeit we were very much to the side. I've never heard of him before, but his performance was animated & exciting. 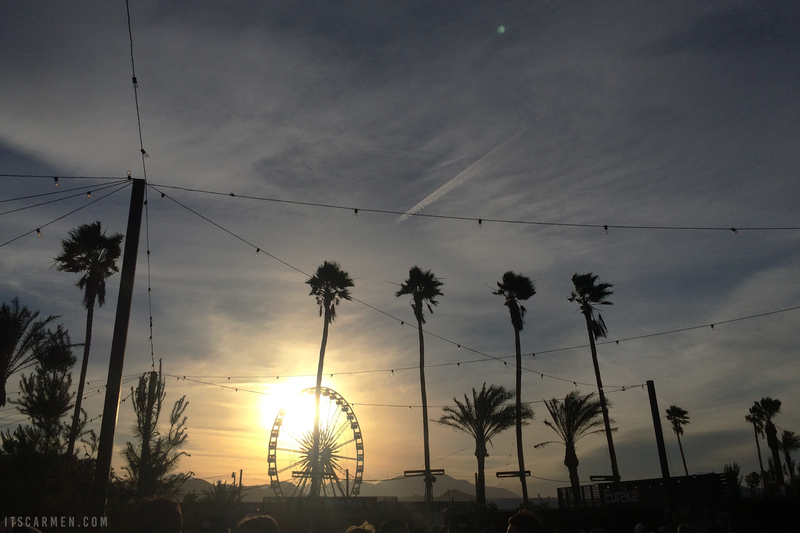 Wind - There's sun & there's wind at Coachella. Be sure to carry a bandana or scarf with you or else you'll end up with black boogers & CoacheLung, as it were called — essentially a horrendous cough created by inhaling all the dust. X-stasy - Speaking of neighbors, the Coachella goers a couple spaces down from us had quite an experience. A police officer approached me & told me that a gentleman had had some ecstasy & wasn't feeling well & to let his camp mates know where he was: at the medic. Yikes. Yummy - We indulged on so much good food & have no regrets about it, despite the hefty price tag. 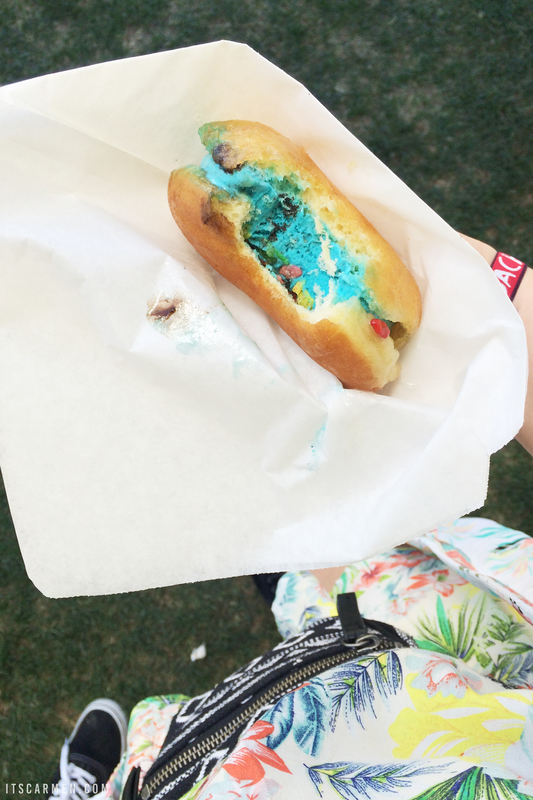 These foods were unique & will forever remind us of our Coachella weekend. Zigzagging - With the crazy amount of people at Coachella, it's only natural that you'll be zigzagging to get to any destination, weaving carefully between those walking & the sneaky people sitting down on the ground. This gets particularly tricky at night. Sounds like you had so much fun!! That ice cream sandwich looks so good! Love this kind of post! sound like you had a great time!! I love this post! Coachella sounds so much, I can't wait until I'm 21 and I can go! haha. 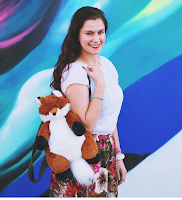 Love the way you set up this post and love your pictures! You truly had an amazing time at the coachella, I love the food and the musicians you mentioned are pretty cool. Love your look too! Wow, what an awesome time! That Milky bun looks amazing oh my goodness! I have such a sweet tooth for things like that. 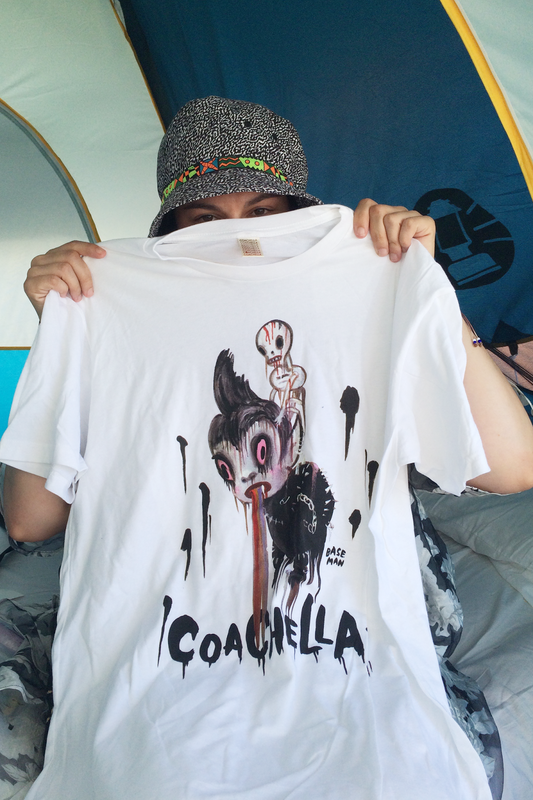 You are so lucky to have gone to Coachella, and it looks like you had a great time and were so prepared! I'd love to be able to see A$AP Rocky, that must have been a fun performance to see! Never heard of an ice-cream before. Now, that is worth trying. Loving this! First - omg Coachella 😍 and second - really like the idea of an A-Z post!